You don't want to trek for several days, or you don't have enough time ? Try a day hike ! 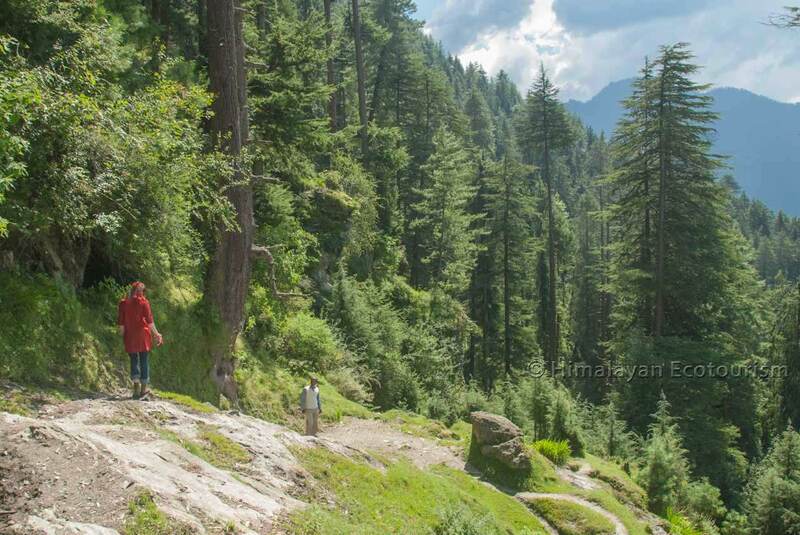 The remoteness of the GHNP makes it inaccessible for those who have only one day. At most, in a day time, you can reach its gate and come back. But the ecozone and surroundings of the park hide some very beautiful places. 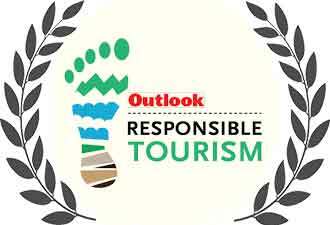 For you, we have selected a few day hikes that feature no technical difficulty and that are accessible to most of us. 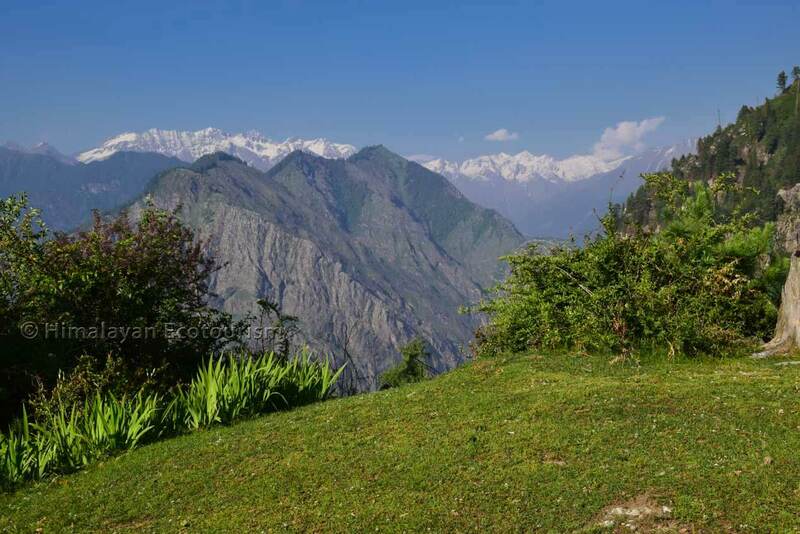 These hikes gives you a refreshing experience of the people and the scenery of the Himalayas. 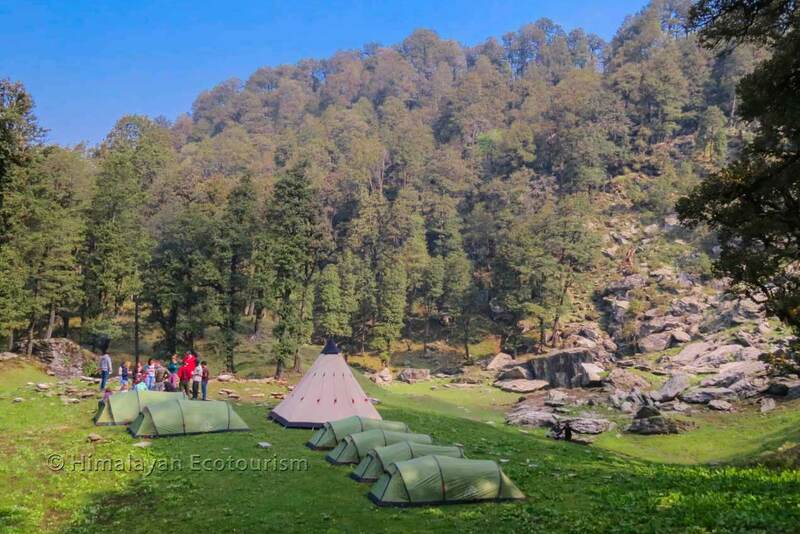 If you wish we can easily transform these hikes in a "camping in the wild" experience. 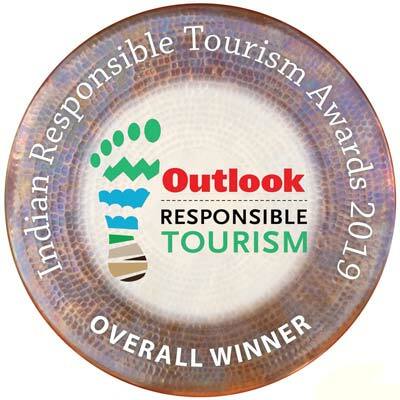 We are so good at offering the feeling of being one with nature, without compromising on your comfort and your security. Contact us for many other hikes or multi day treks that we can suggest you. 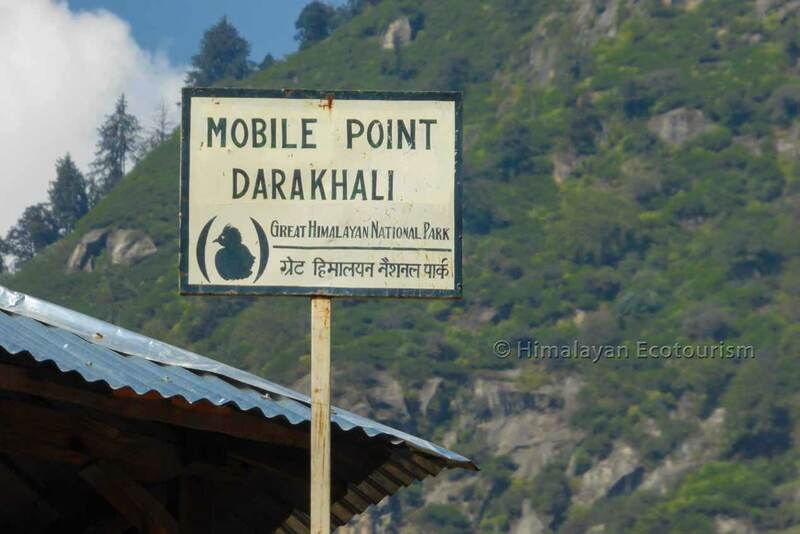 This should help you in locating the various day hikes that you could do with us around the Great Himalayan National Park. 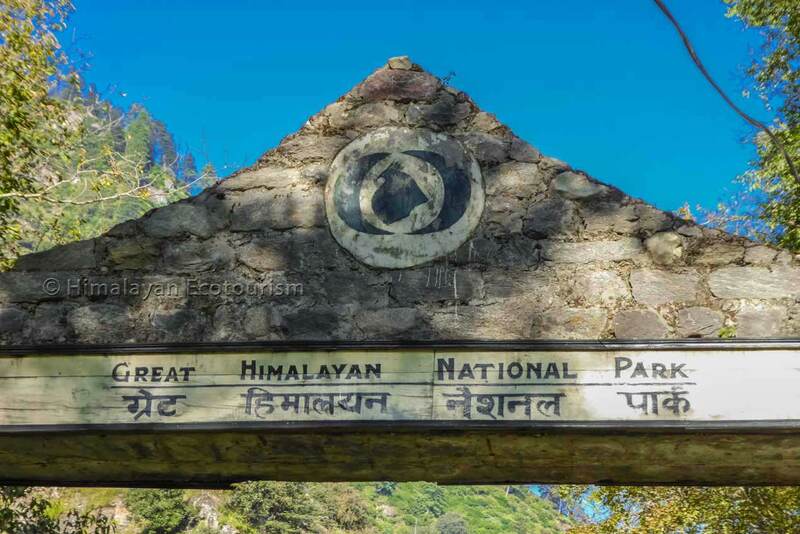 The Great Himalayan National Park is not reachable by road. So you need to walk to reach the Park's gate. 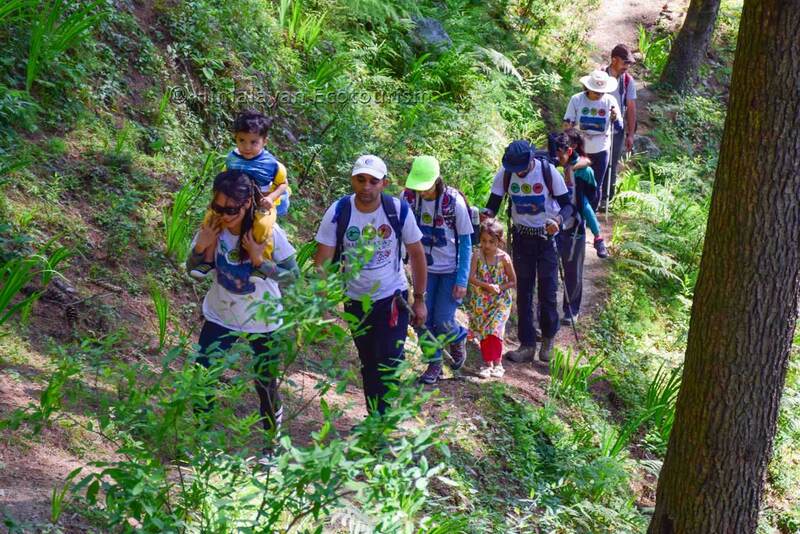 Actually it is a nice hike which starts from Gushaini. You go back via the same way. 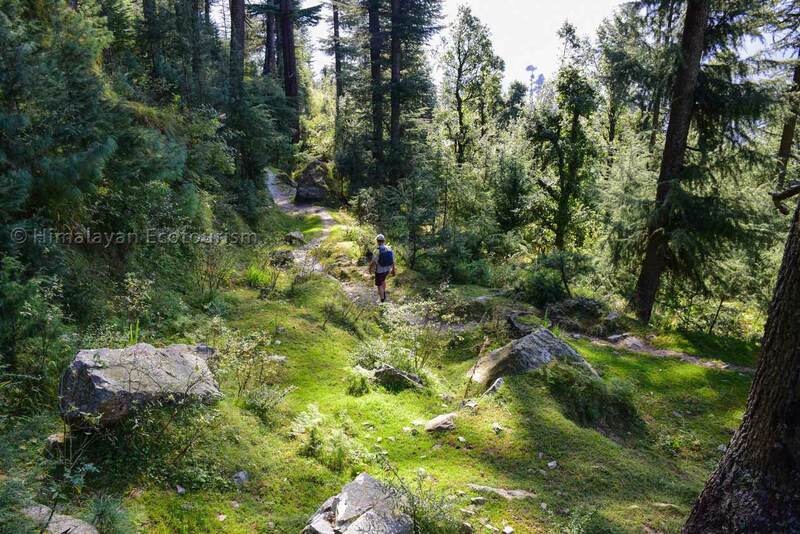 The trail to the Park Gate goes smoothly along with the Tirthan river, crossing a few villages and some beautiful forests. 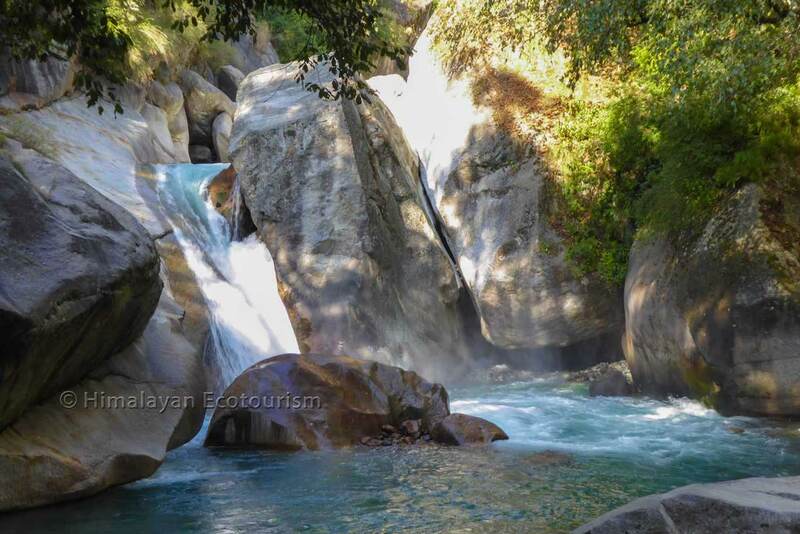 This hike is a good choice for those who want to approach the Park in only one day. 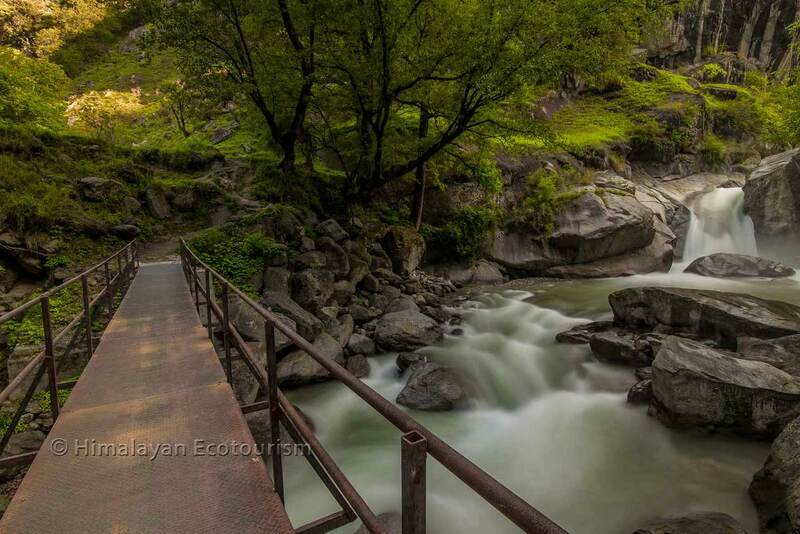 At the gate, the Tirthan river and its environment are fascinating. There is no steep slopes on the way and so it is accessible to anyone with an average fitness. 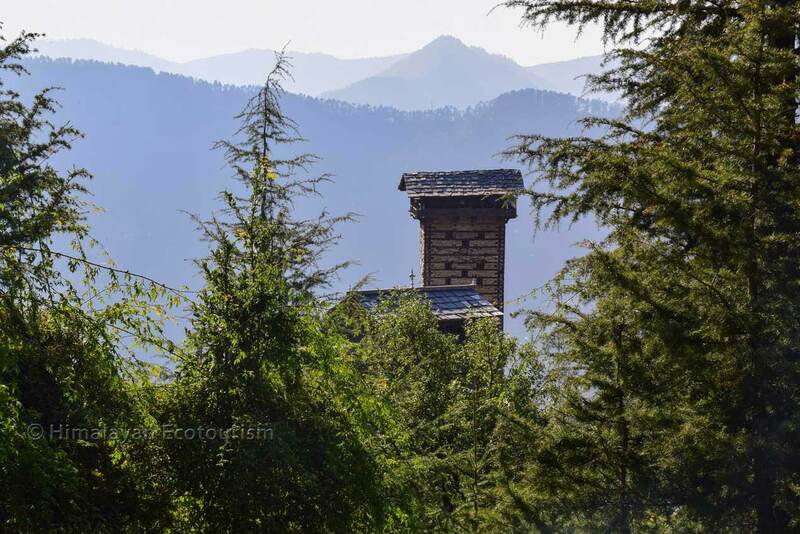 The difference of altitude between Gushaini and the Park's gate is only 430 metres. It takes approximately 3 hours to go to the gate and 2 hours to come back. You can have your (packed) lunch at the Park Gate where there is a very peaceful campsite beside the river. 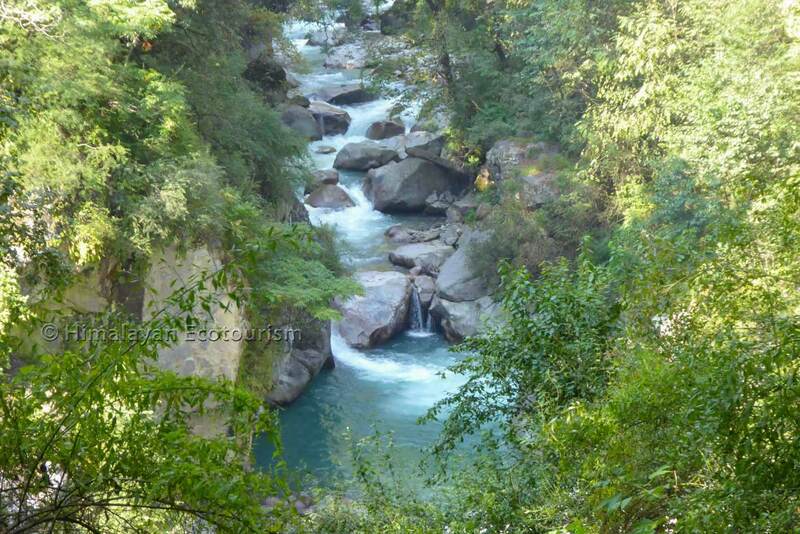 You remain in the company of the Tirthan river during the entire hike. 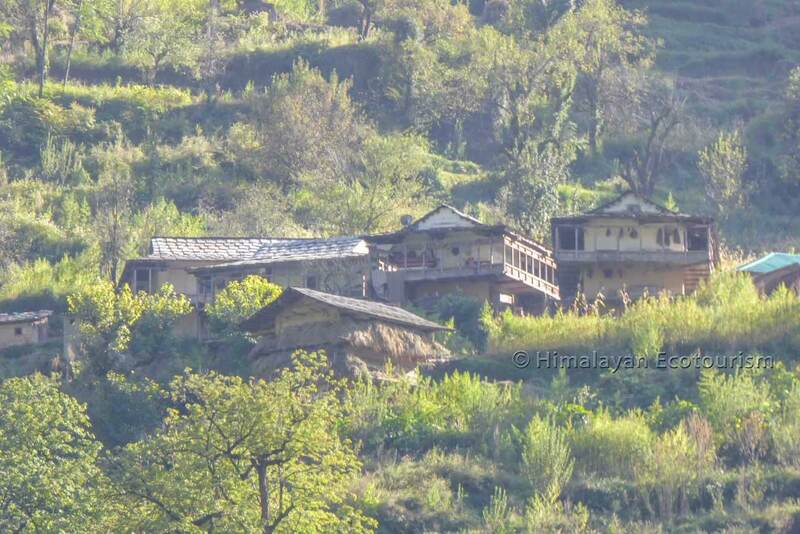 You come across several villages showing the traditional architecture and lifestyle of Himachal. A lovely river scenery at a short distance from the GHNP gate. This boulder has a shape that makes you think a Hippo is having bath front of you ! 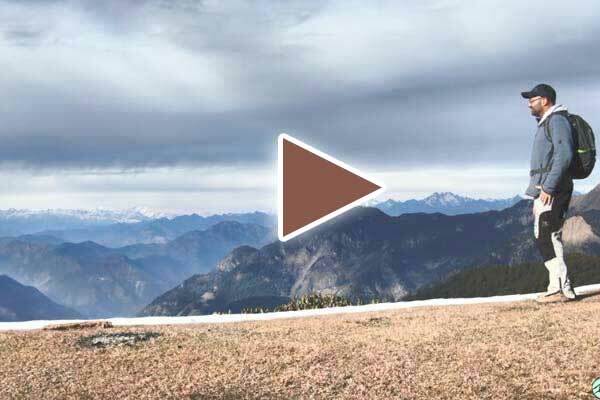 You will have no phone disturbance during most of the hike. But you can give a call from here. 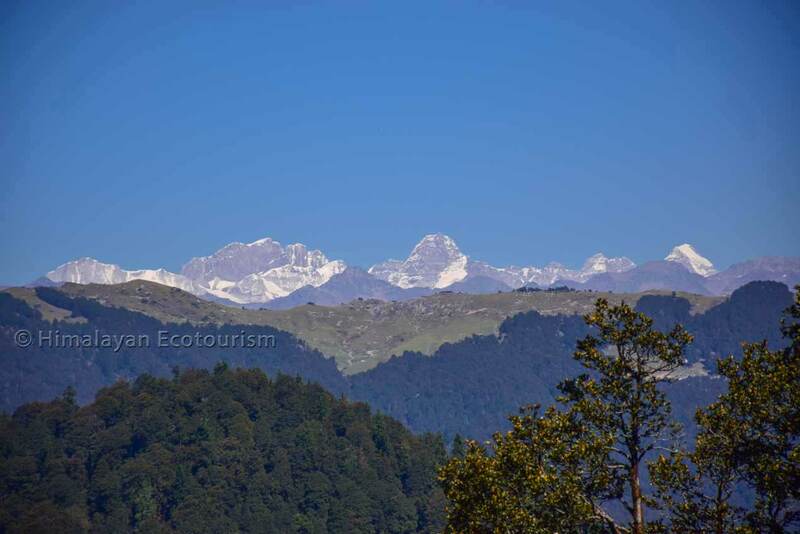 Your day starts with an awesome jeep safari to Jalori pass (3130m) via a spectacular road winding through lush forests of Himalayan Cedars and Golden Oaks. From Jalori pass you have a choice ! 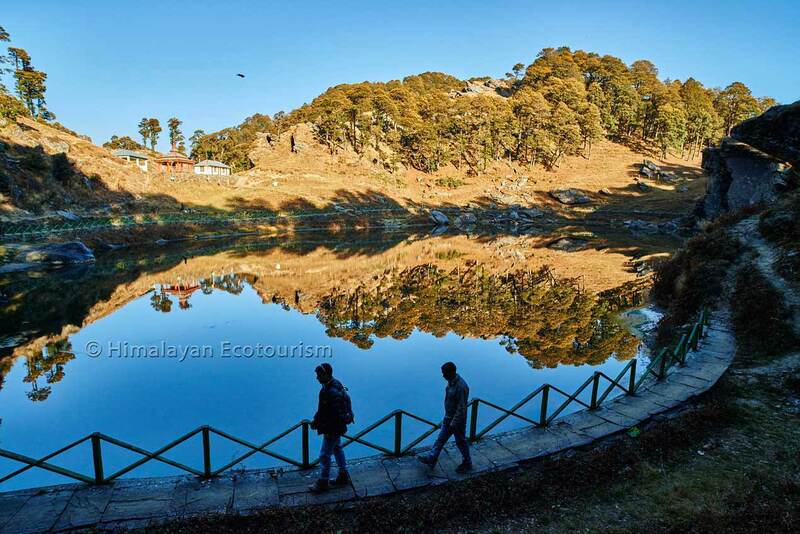 Either you walk eastward to reach the Serolsar lake, or westwards to climb to the ruins of the Raghupur fort. The return trip to the lake will take about 4 to 5 hours. Whereas a return trip to the ruins will take only 2 or 3 hours. So which side will you go ? The hike to the lake is very easy (despite the altitude). 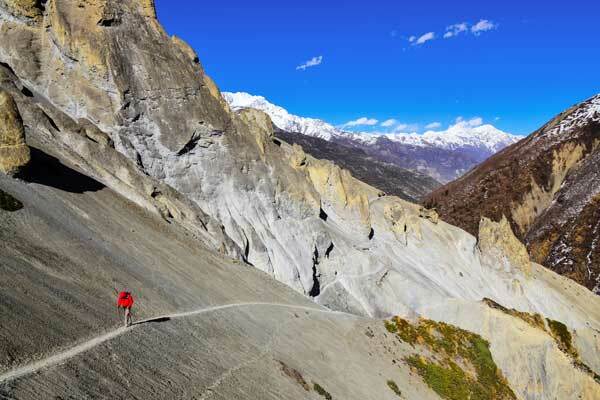 The trail is quite comfortable and there is no steep slope to climb. 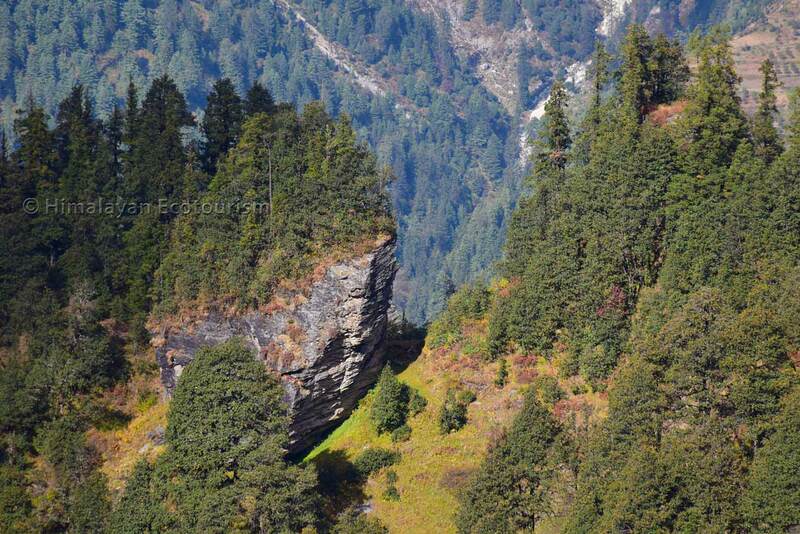 You walk mostly under the trees and the views are towards the lower Himalayas Shimla) in the South. 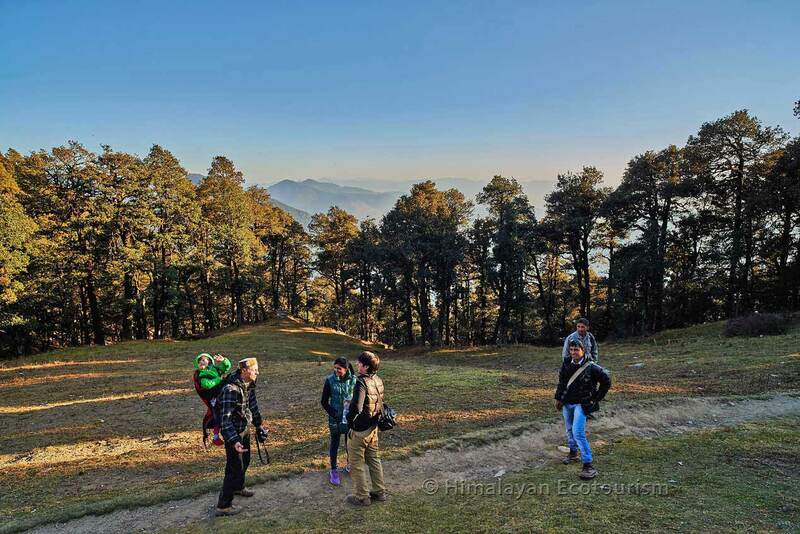 The hike to Raghupur is shorter but steeper and offers dramatic views of the Himalayan range. Raghupur lies on a very scenic meadow. It is no more a fort but long piles of stones with a small charming temple on the way. 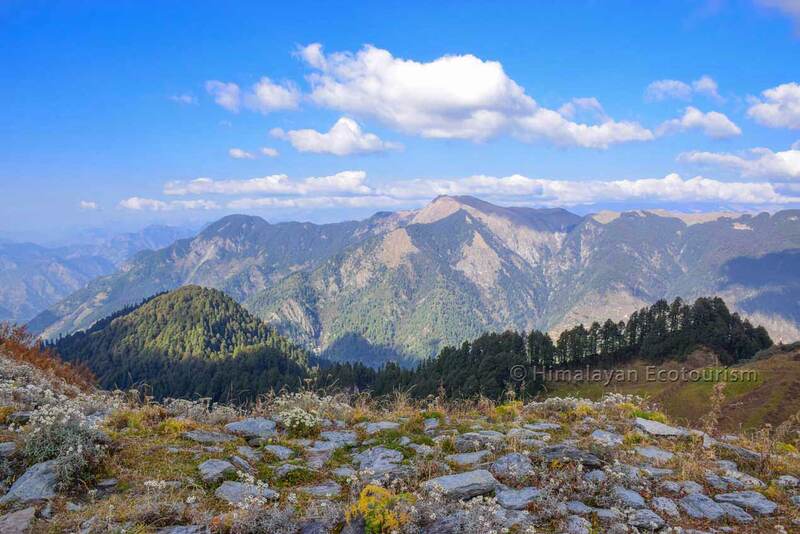 Another option from Jalori is to climb to a nearby meadow which offer a similar view than Raghupur. You can go there, spend a little time to enjoy the landscape, and come back within one hour. The last village on the way to Jalori. You can stop there for a tea break. 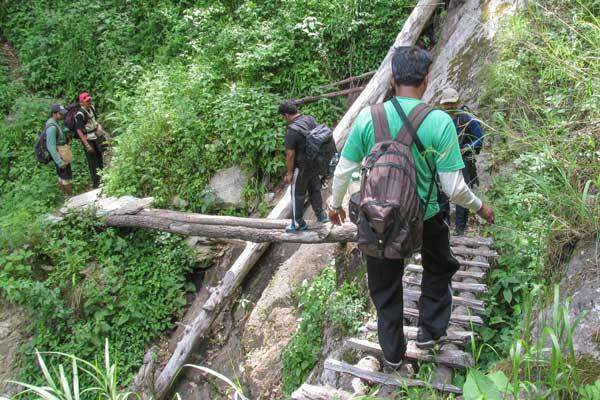 There is no technical difficulty on the hike to Serolsar lake. The way to Serolsar offers nice views of the lower Himalayas. The lake is a sacred place worshipped by the locals. The area is frequented by shepherds who have build some fascinating shelters. 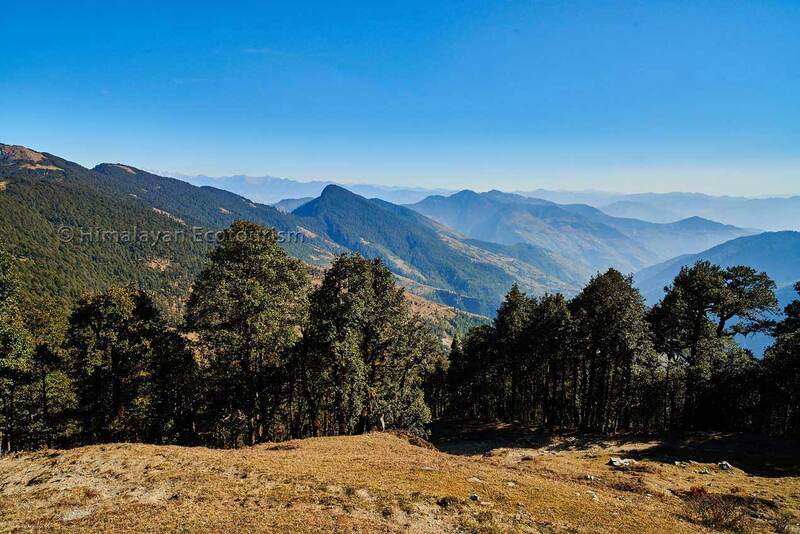 The hike to Raghupur offers a stunning view of the Great Himalayan National Park. From Raghupur you have a 360 degree view. The temple adds to the magic of the place. 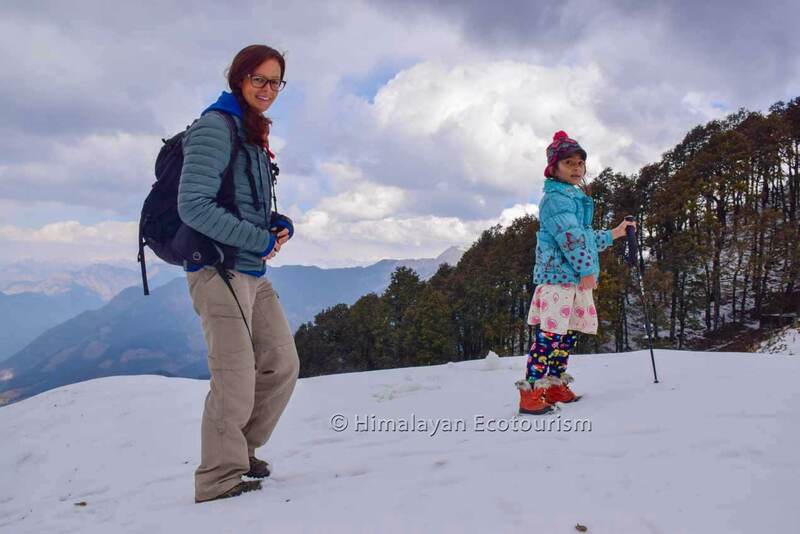 Both the hikes allow you to observe a very beautiful Himalayan ecology. Near Jalori pass you have a great variety of birds. Here a group of colorful Minivets. 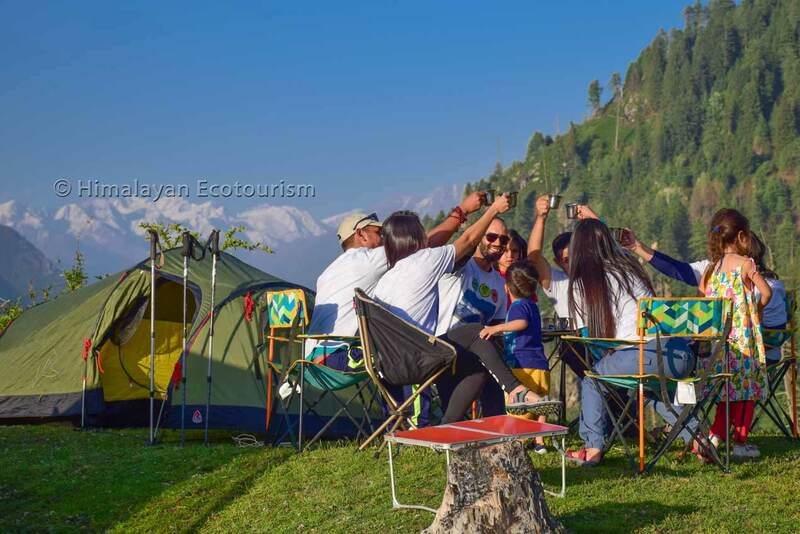 Why don't you try the experience of camping in the wild. We are very good at that ! 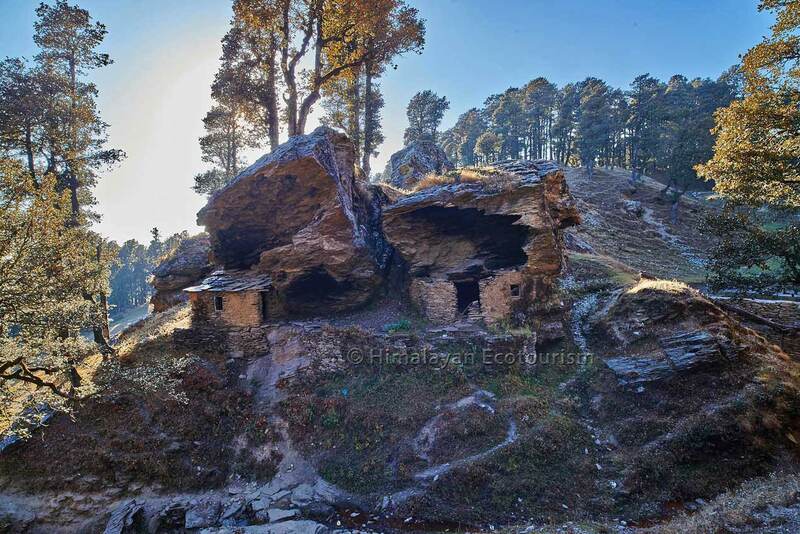 Hiking from Jalori will surprise you with some astonishing natural curiosities. 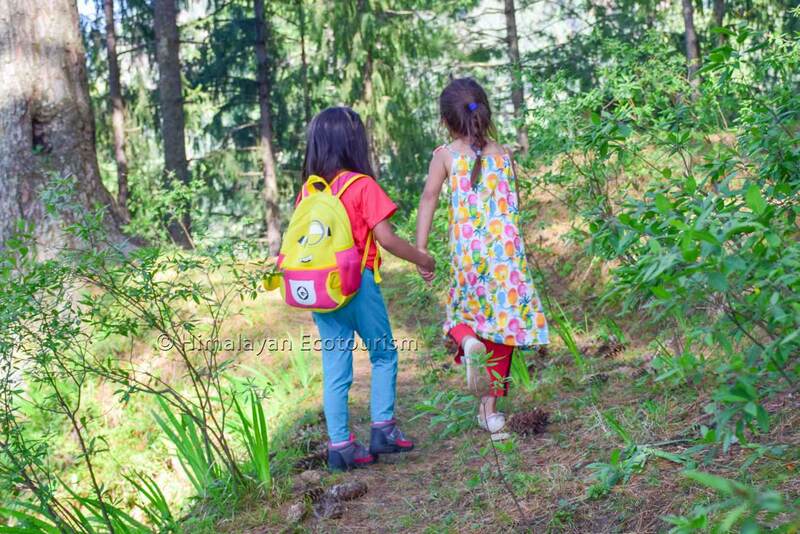 Another good aspect of these hikes : your kids will simply love it ! Have fun plying with the snow. 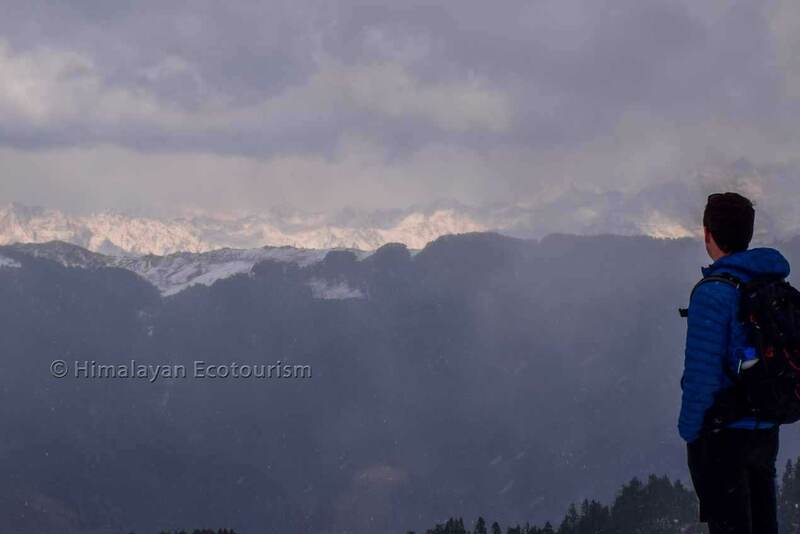 The photo shows the coming snowfall. 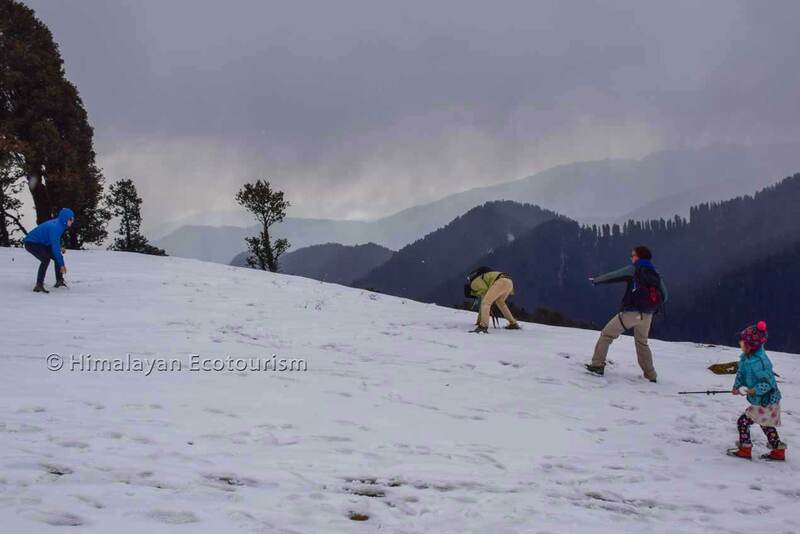 This hike is accessible to most of the people and gives you, in a half or a full day, a great experience of the Western Himalayas, in a place untouched by tourism. 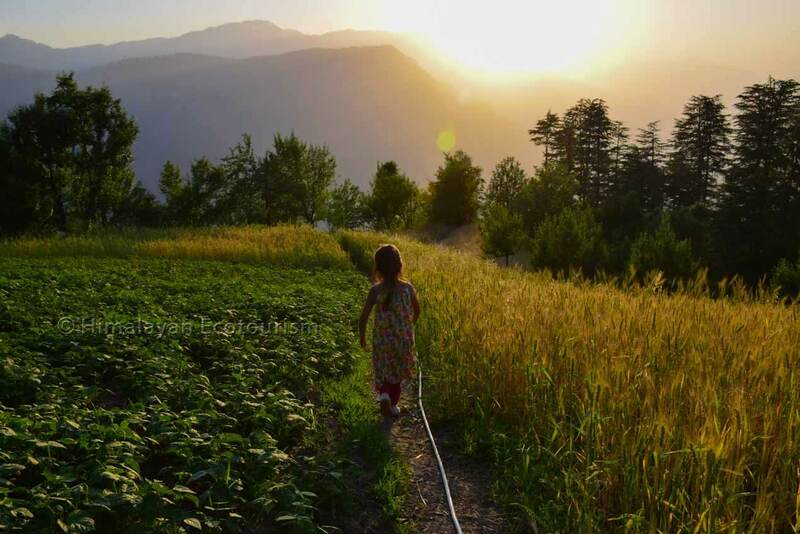 The trail delves you into lush forest, terrassed fields and exposes you to the traditional lifestyle of the Himachali. 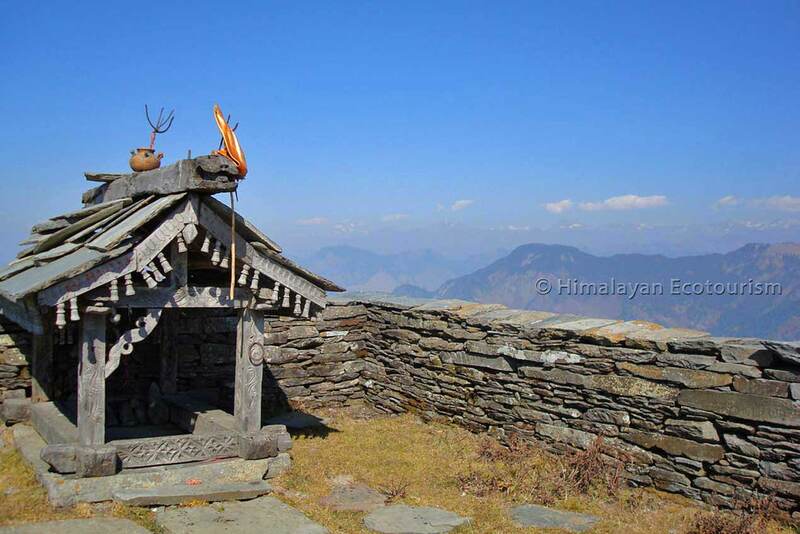 The first step, Myagi, is a spectacular viewpoint to the Great Himalayan National Park. 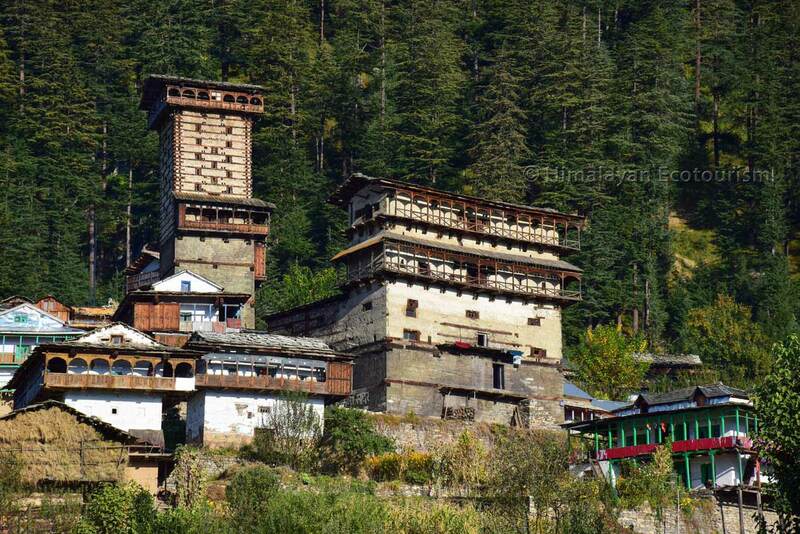 Then, Chehani, the village where stands Himachal Pradesh’s tallest temple. 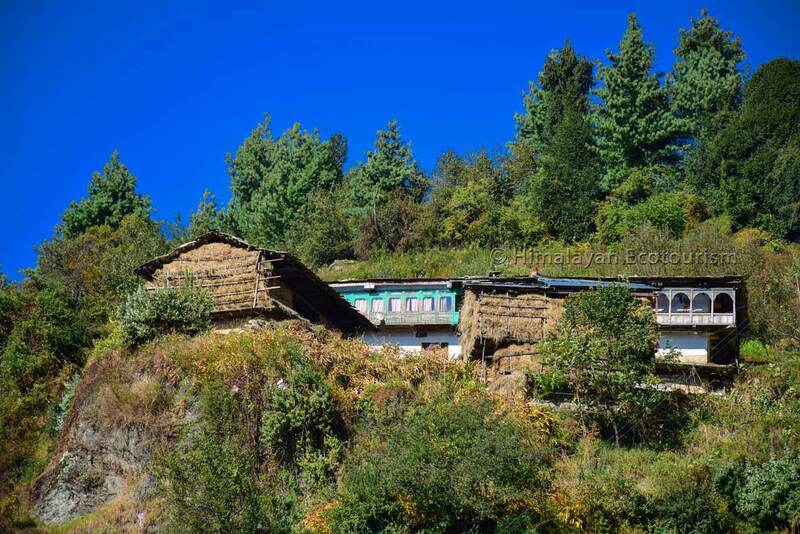 The villagers are God Fearing people, mostly occupied in servicing the local Devta—Shri Shringa Rishi whose the temple is accessible on this hike. The history of the Devta can be gathered from the pujari. 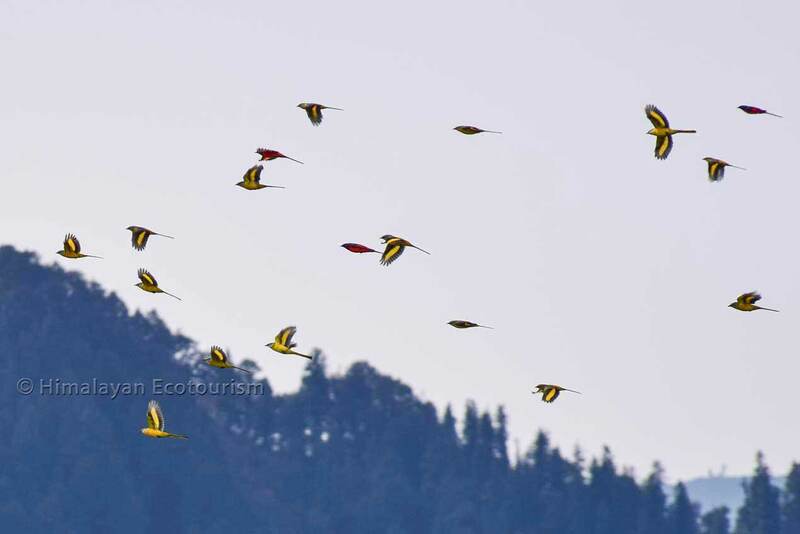 The area is also an excellent choice for those who wish to observe many Himalayan birds. 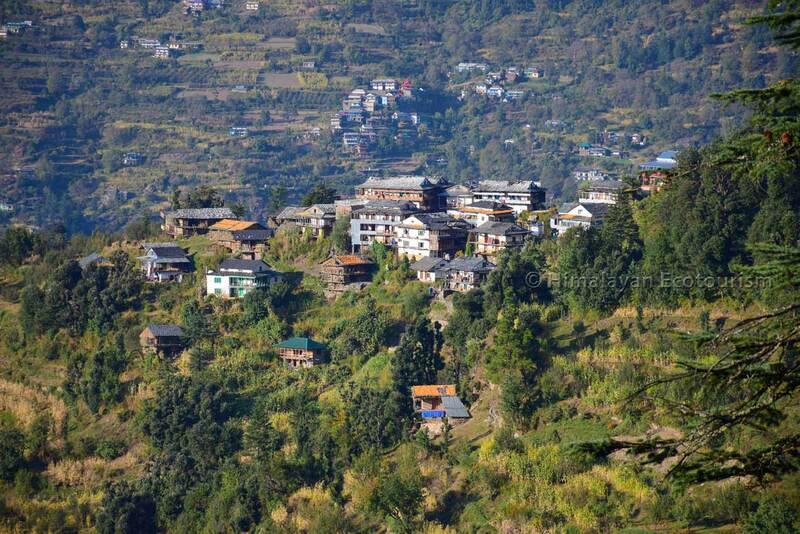 You hike starts from here, a traditional Himalayan village. 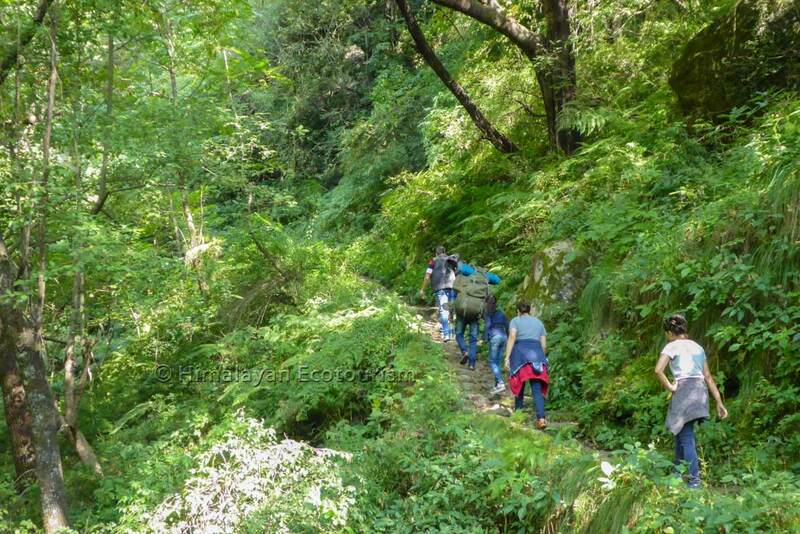 The first part of the hike takes you through an amazing forest of Himalayan Cedars. 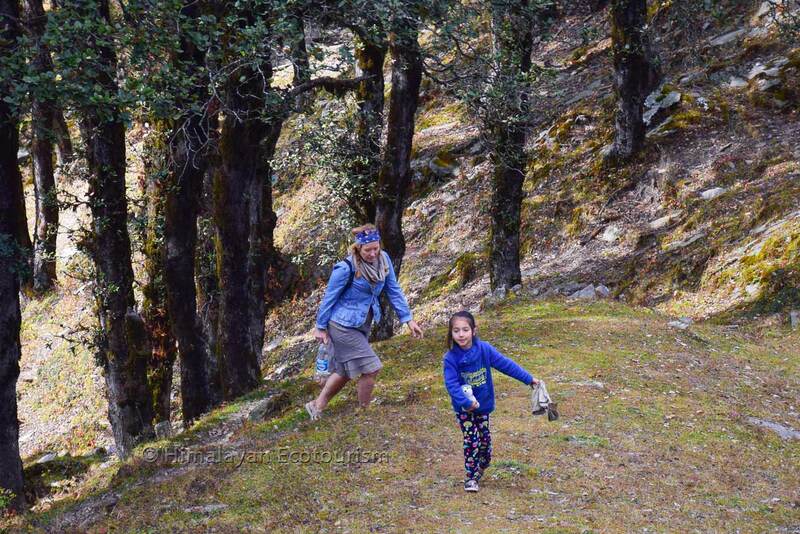 Taking your kids on this hike will offer them a life's most memorable experience ! 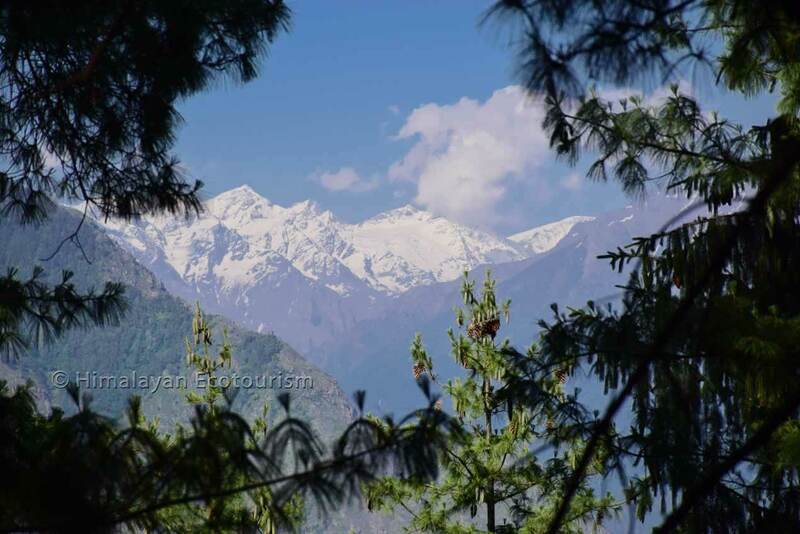 Soon, through the trees, you will discover the Himalayan giants. 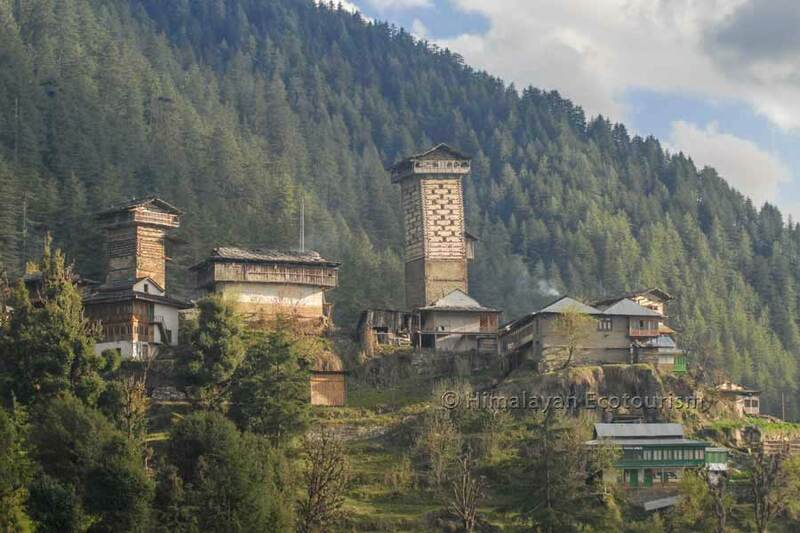 Myagi is a tiny village with a meadow that offers a great view of the GHNP. Fabulous sunsets can be experienced on this hike. 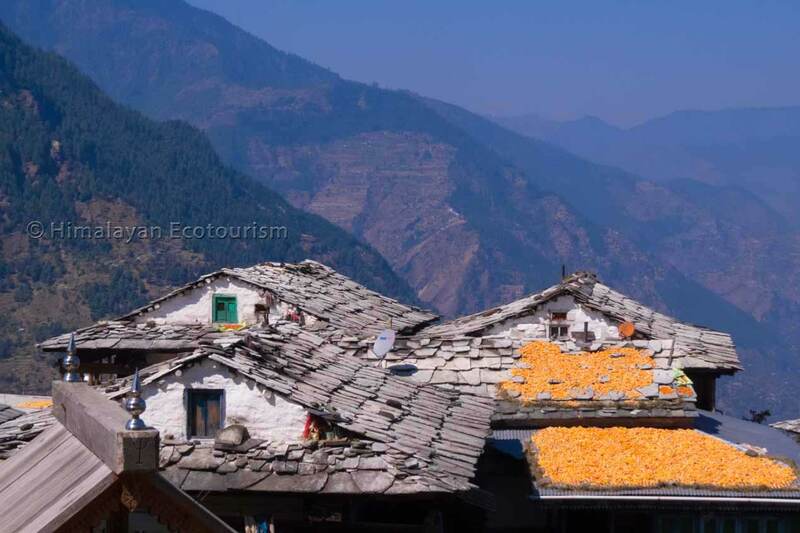 See how these villagers can manage so far from the civilization. 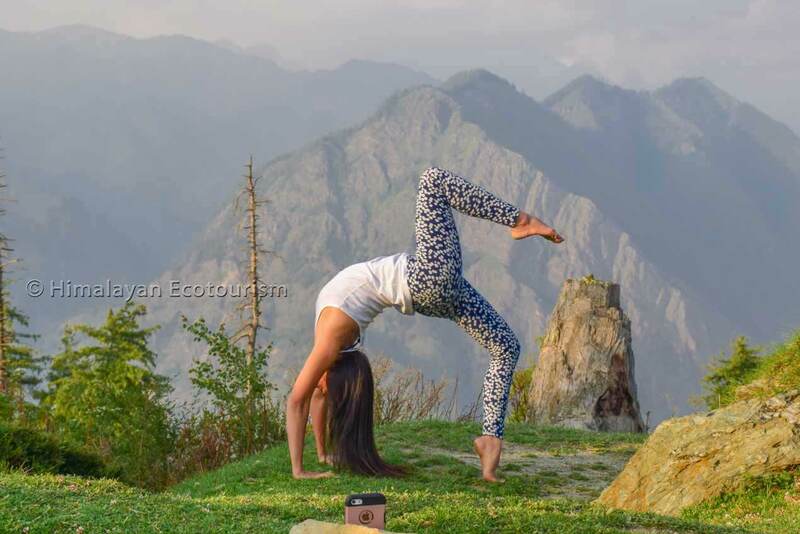 We use to organize Yoga sessions at the Myagi meadow. After Myagi you descend under the auspices of hundreds-year old trees. It is such a pleasure to let the gravity to take you through such natural environment. 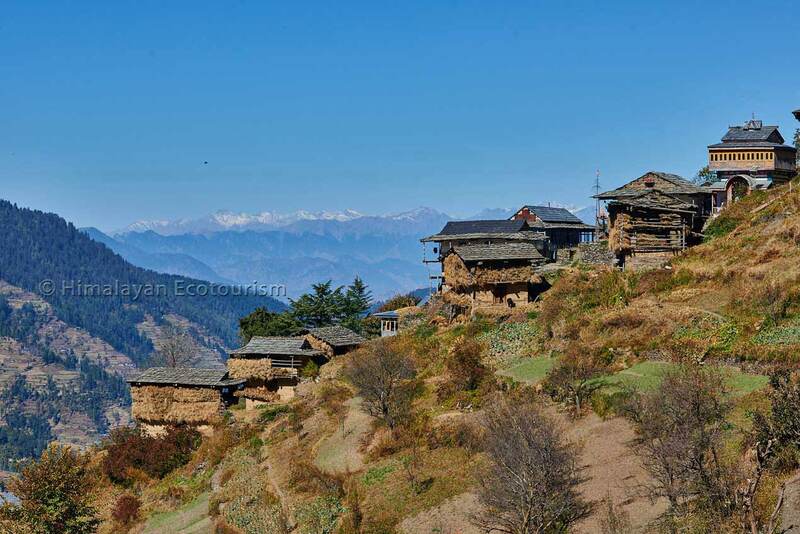 Enjoy a pure Himalayan lifestyle in Chehani. 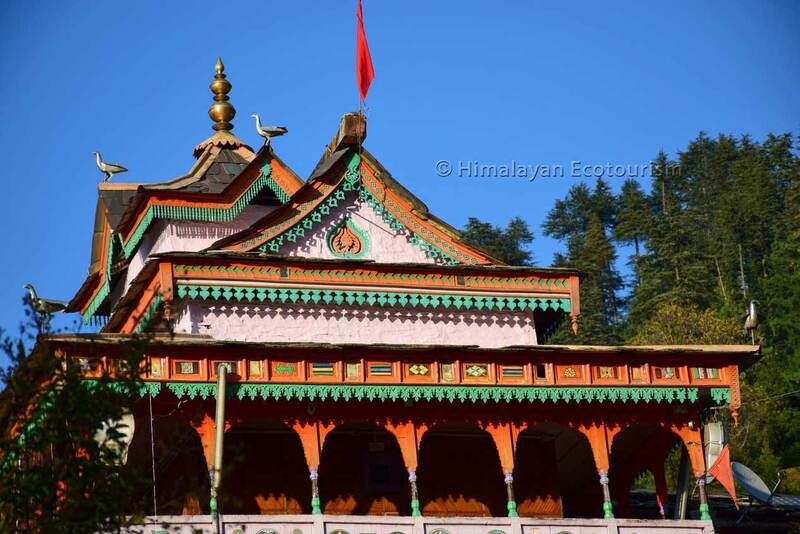 On the way back you can visit the temple of Shringa Rishi, the main Devta of the valley.